Hey everyone! I am super excited to share this new look for you all. Here is a look I did using the brand spanking new Aquataenia Palette from Lime Crime! It is beyond words gorgeous! I can think of so many different looks that I can do with this palette. This is my first Lime Crime eye shadow palette and I am definitely hooked! 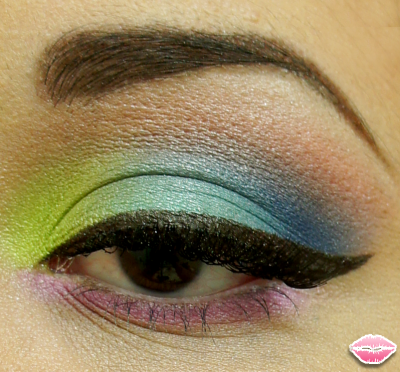 I decided to incorporate all of the colors into this eye look. 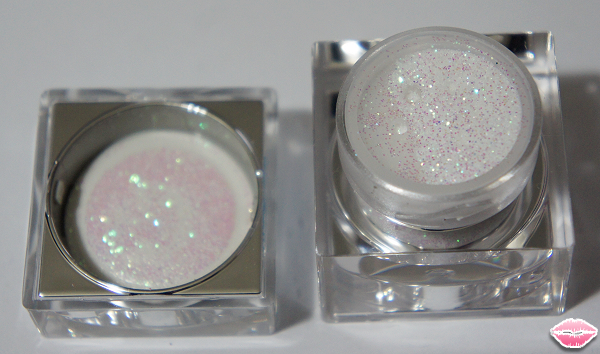 I also purchased the Lime Crime Eye Shadow Helper primer and it worked perfectly! The colors stayed vibrant all day with no creasing. 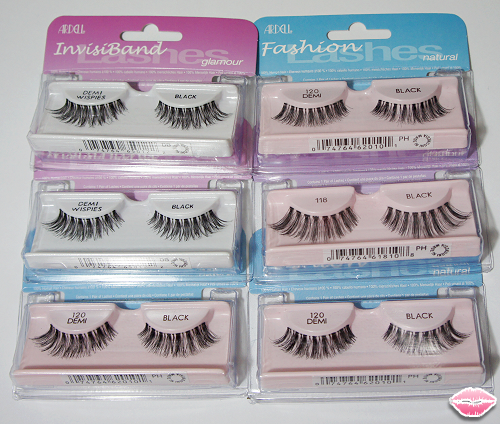 This product launches on JULY 5, 2012! Be sure to pick yours up! » Overall Rating - I love this palette. There are a variety of colors. 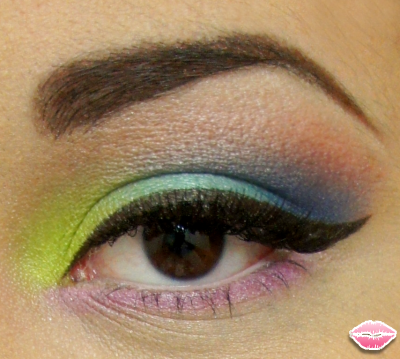 If you are feeling adventurous you can create a bright looking using all of the colors. 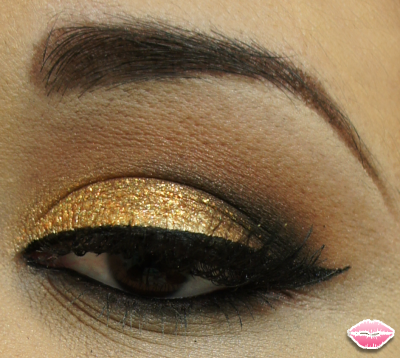 You can also use any of these colors for that extra pop of color that you are looking for with a neutral look. The color payoff is awesome! With a variety of 5 eyeshadows to use I definitely think it is worth it. Hey everyone! I am back from IMATS LA!! I had tons of fun. It great meeting all of you and getting to see the Pros at work. I will have a separate post on my pictures that I took from IMATS so for now here are all of the goodies that I got. Beyond excited to try everything out! For those of you that attended IMATS what did you all get this year? 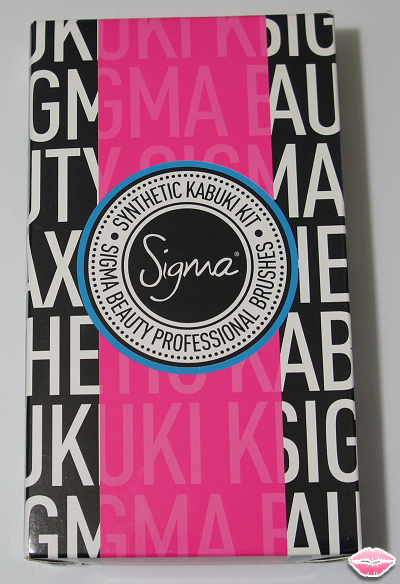 First stop was Sigma Beauty! 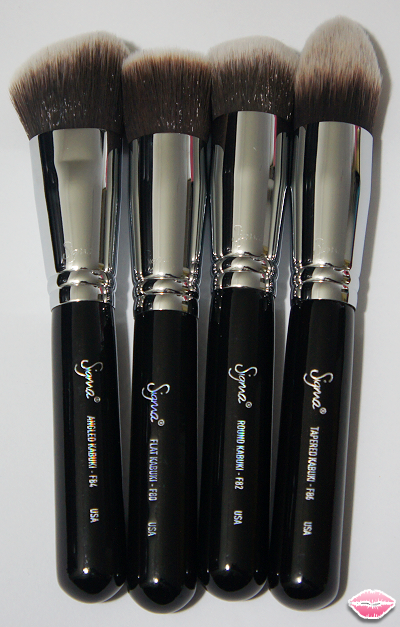 I was so excited to see all of their different brushes. I need them all! I chose their Synthetic Kabuki Kit. I read amazing reviews on them and had to buy! I will definitely post on what I think about them! I also picked up the precision flat P80. 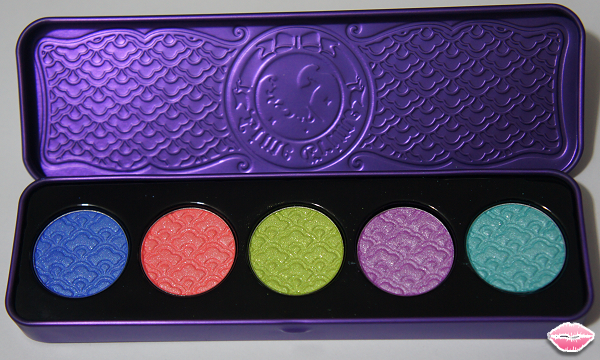 Lime Crime's new Aquataenia Palette. These colors are gorgeous in person! I will post a look using this look soon! 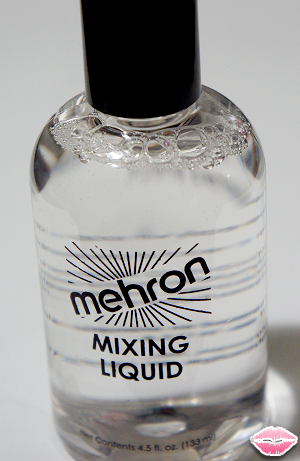 Mehron Mixing Liquid. 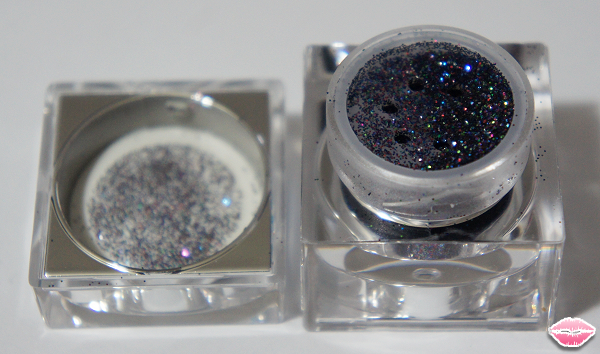 Can't wait to turn my loose pigments into eyeliners. 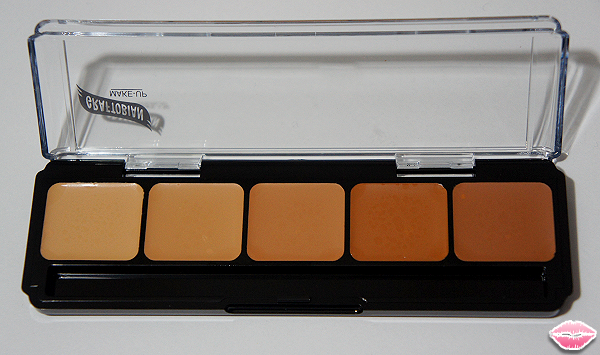 Graftobian HD Glamour Creme Palette - Warm #2. A must have! I was tempted to buy the bigger one! 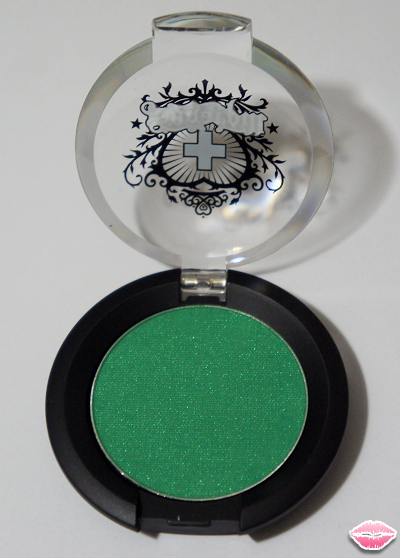 Sugar Pill Royal Sugar Loose Eyeshadow. I mean come on, look how pretty that is? 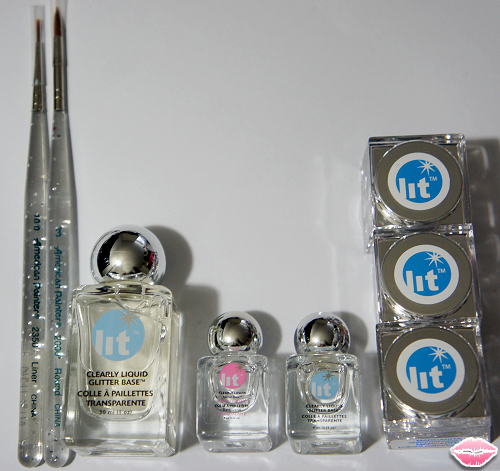 Lit Cosmetics. 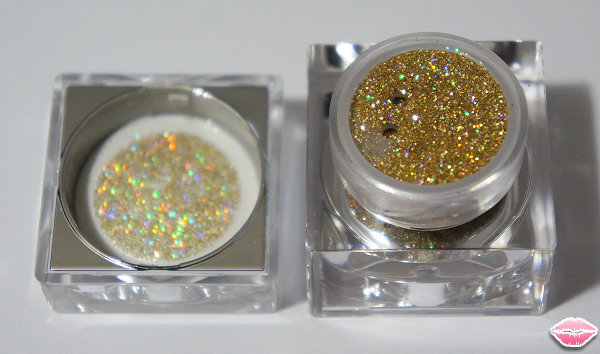 I was in glitter heaven!! They had an amazing deal going on. This whole kit was $40. Two brushes, one full size of their popular clearly liquid glitter base, one travel size, one travel size of the h2o proof base and 3 glitter colors! So there was my IMATS 2012 Haul. IMATS has been moved to January 2013 next year instead of June. Can't wait to see you all there again! Sigma Beauty is also having a 10% off IMATS promotion. 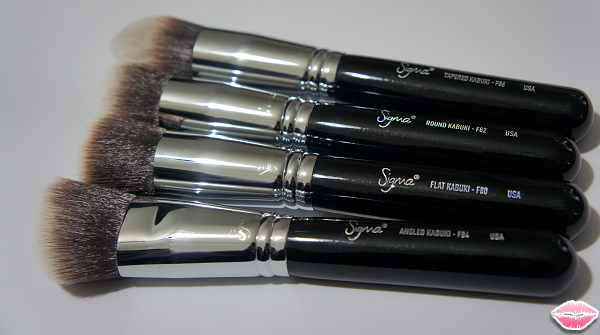 If you click my affiliate banner below you can browse all of their awesome brushes and get 10% off your purchase! Hey loves! 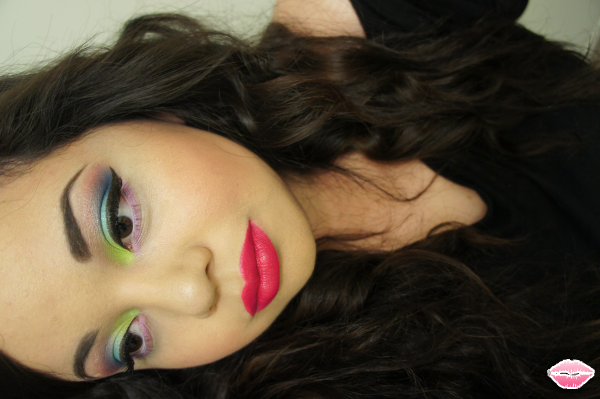 I am trying to get all caught up on my posts before I leave to SoCal for IMATS! I am super excited! Last year was really crazy so I am going with a list and a game plan this time around. I really hope to see you all there! Please stop me if you want to say hello! I would love to take pictures with all of you and post them here. 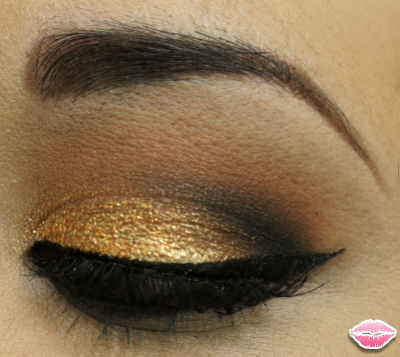 I am really happy to post this smoky gold eye look that I did for my birthday this year. I was very fortunate to have Beautylish post this look on their Facebook page and today it was also featured on their latest article, Go for Gold! I had so much fun doing this look and I hope you all like it! Hey everyone! 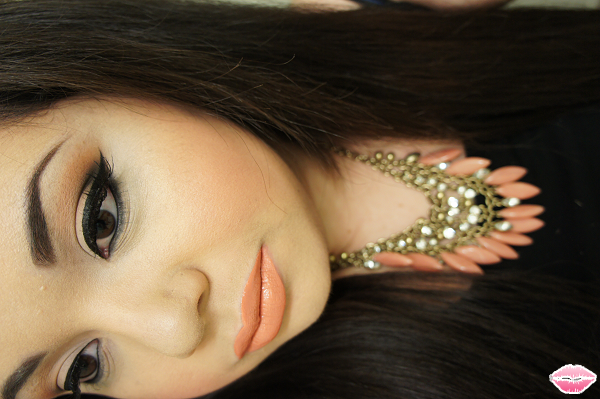 Here is another look.I was definitely inspired by this gorgeous necklace that I picked up from Forever 21! I mixed Kava Kava and Grandma lip tars again. This time I would say that it was 90% Kava Kava and 10% Grandma. 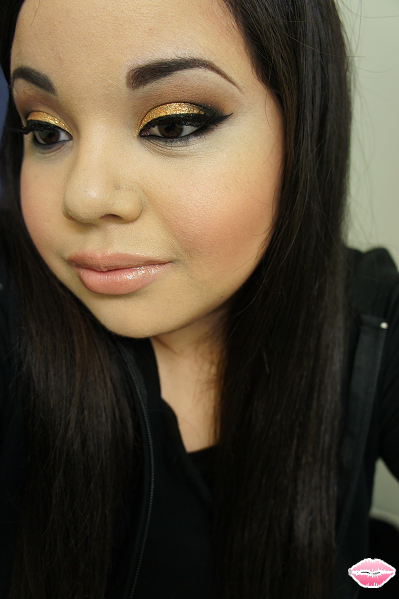 This is a really easy look that I did using my favorite Greed palette from Wet'n'Wild. Hey dolls! 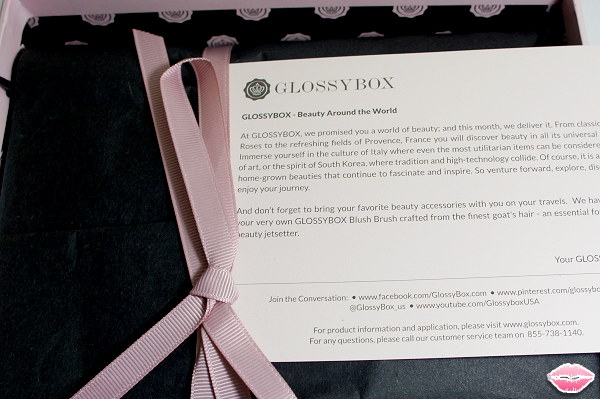 So excited to post about GlossyBox! 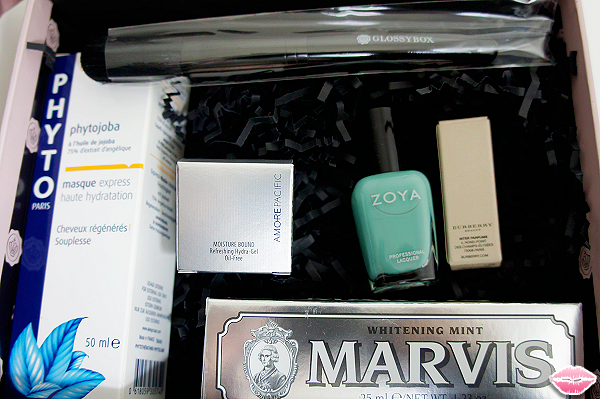 There are tons of different monthly beauty subscription boxes out right now but I really wanted to try Glossybox out. I notice a lot of UK bloggers posting about their boxes and they looked so luxurious and worth it. I was pretty stoked to find out that Glossybox is now available in the U.S! It was so much fun opening up the box and I was really happy about the different products that came inside. I didn't want to ruin the delicate packaging either. Super excited to see what next month box will bring! Ok now let's discuss the May box..
» My Review - I was excited to try an Asian face cream. It had a fresh smell to it and felt really good on my face. I applied it for an early morning out and I noticed my face looked bright and awake. Based on the price I don't think I could allow myself to spend that much on a face cream though. 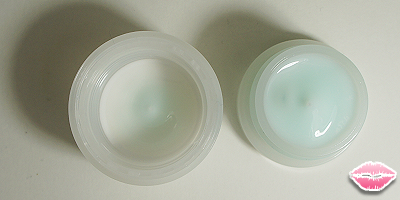 It really kept my face hydrated throughout the morning and kept it soft the entire day. 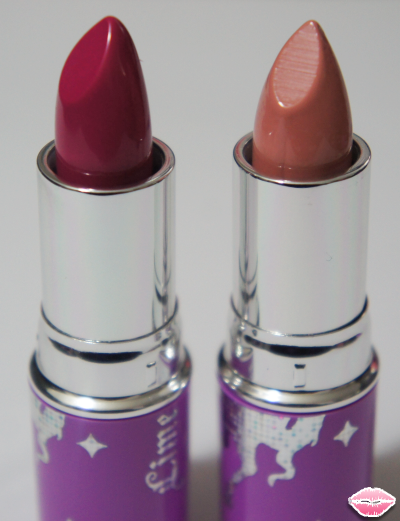 » Description - A creamy lipstick that offers a hint of natural, sheer color leaving your lips moist and dewy. The perfect present for the perfect pout. 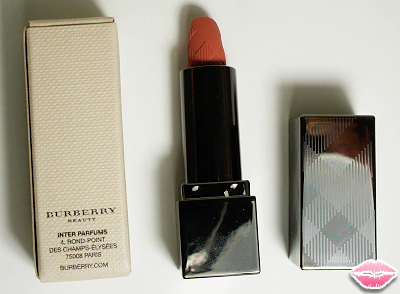 » My Review - Burberry lipsticks are so pretty. They have the iconic Burberry plaid design on them which makes it hard to want to use the lipstick. The lipstick was really sheer. I know it says sheer in the description but I didn't think it was going to be like a lip butter. It did feel good on my lips but once again I can't see myself purchasing this when I can easily dupe this with a Revlon lip butter. » Description - Make the most of your splendid smile with a whitening toothpaste dripping in cool mint freshness, all while protecting against decay, target, and plaque. » My Review - Yay for whitening toothpaste. The Marvis toothpaste had a normal mint taste and I did notice my teeth look nice and bright after each brush. I get the same results with my other whitening toothpaste that is less expensive so I won't be making the switch because of the price point. » Description - Indulge in luxury and aroma with a conditioning treatment that moisturizes and detangles strands without weighing hair down. Nourish, revive and delight. » My Review - I have been on the hunt for the magical mask that will help me with my beyond dry hair. I have notice a tad bit more moisture in my hair but nothing has drastically changed. I used it a few times already so perhaps I need to continue to use it. They gave us a generous amount so hopefully I just need to use it to see more results. » Description - Dive into the creamy shades and shimmering sea foils of the Zoya Beach & Surf Collection. Allow your nails to go on vacation every day. 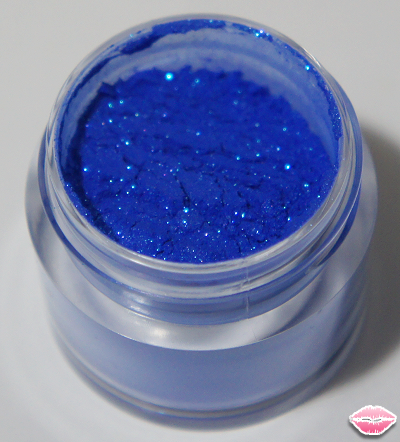 » My Review - I received the gorgeous color named Wednesday. I was beyond excited. Wednesday has been sitting on my shopping cart on Zoya.com for the longest time! 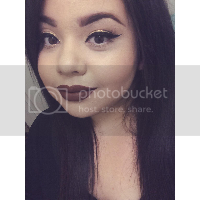 I immediately fell in love with that color but was waiting for it to be in stock at Ulta. You can just picture how my face lit up with I saw this gem inside the box. I love Zoya nail polishes and this color is perfect for summer. It will look with any outfit. The color is so creamy and only takes two coats to make the color pop.